From Mao to Xi, leaders of PRC are good in using catchphrase heralds to impose its hard lines ideologues on dissident of Tibetans and other alike. PRC initially marched in Tibet under the guise of wishing to aid in development and improve the living standards in the secluded country. Soon Tibetans witnessed the true color of PRC, when Tibetans were given ultimatum to sign the 17 points Agreement in 1951.Since then in order to “Senocize” of Tibet , PRC has imposed “Great Leap Forward” under socialist Democracy; capitalism in the color of Socialist Market Economy, consequently, it proved to be disastrously counterproductive, contributing to the first ever famine in Tibet’s history, destruction of Tibetan identity, widespread self-immolations, and growing instability across the Tibetan Plateau. Now Xi, like his predecessor, rhetorically endorsed “Socialist Rule of Law” with Chinese characteristic without being scope for Rule of Law. The Rule of Law was coined by Sir Edward Coke and later developed by Prof. Dicey. Rule of Law means “…no one is above the law and every man including King, is subject to the ordinary law…” In India, the concept of Rule of Law can be traced back to the Upanishad (Ancient Philosophy before 6th century BC). It provides that Law is the King of Kings. As per the Chinese ‘Rule of Law’, party is the law and what they says is law! And it is deliberately misleading and overturning the very spirit of Rule of Law. In fact, it is not rule of law as we understand, rather law is being used for tools to suppress the society in order to impose and sustain their authoritarian regime. Party has pledged to the legal reform. “The judicial system is the last defense for social justice," Xi was quoted as saying. "If it fails, the people will widely question (the ability to realize) social justice and stability will hardly be maintained." But in practice, the question of judicial independence remain untouched. The judges are hired, paid, promoted and fired by local officials. Most of the judges are under qualified who were either formerly military or police. The sensitive or political cases are decides in the closed door by adjudicating committee composed of bureaucrats. Lawyers are literally handicapped at the mercy of officials and those who undertake political sensitive and human rights matter were either license to practice are seized or illegally incarcerated or both. 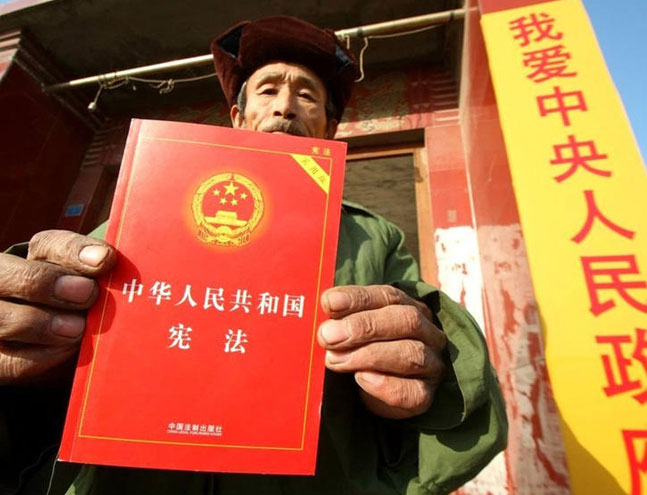 PRC’s Constitution guarantees; Rights and Interest of Minority nationalities, develop inhibited by minority as per their need and Regional Autonomy; Constitution supremacy/Rule of Law; Rights to criticize and make suggestion; Freedom Speech, Press, Demonstration; Religion Rights, Human Rights and other rights. In substance, on national ‘Constitution Day’, the most censored word was ‘Constitution’ according Weibo. Citizens who challenged the inaction of the constitutional law and Rule of Law by the party, are arbitrarily, extra judicial arrested, prosecuted on baseless charges and executed. The struggle of Tibetan is squarely within ambit the provision of the Chinese constitution. But Chinese Communist continues to deny and called struggle of Tibetan as disguise Independent. So Tibetans are victim of denial and Communist Party of China is hostage of denial. As a result, Communist party continue to impose hard line policy, the veracity of crime was witnessed by foreigner journalist who visited in 1979, described Tibet as ‘the graveyard of a murdered civilization.” So, Tibetans left no other way to redress the atrocity policy but burn themselves to death, since Feb 27, 2009, 141* Tibetans have self immolated in Tibet and China.